Scott Schebler hit .359 for the month of July. LOUISVILLE, Ky. - Louisville Bats outfielder Scott Schebler has been named the International League Player of the Month for July, the league announced Monday. 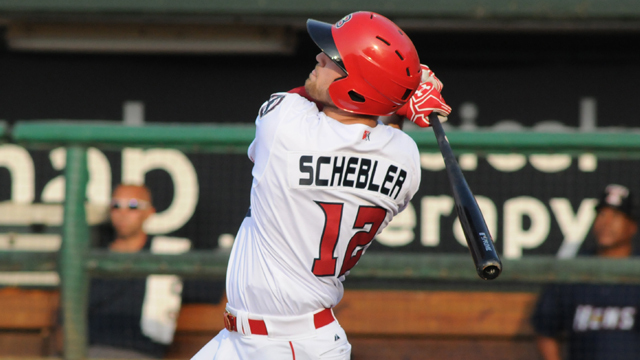 Schebler, 25, joins Jermaine Curtis (April) as Louisville IL Player of the Month recipients this season. According to the IL, it is the second time in Reds affiliation that the Bats have had multiple player's of the month in one season. In 2002, Juan Gonzalez (May), Brandon Larson (June) and Kevin Witt (August) were all named Player of the Month for the Bats. Schebler continued his terrific June into an even better July and hit .359 for the month with six home runs and 18 RBI. He recorded 10 multi-hit games in the month, including six two-hit games, two three-hit games and one four and five hit game. The five-hit game on July 26 was the first for a Louisville Bat since Juan Silverio on June 17, 2014. While going 5-for-5, Schebler hit for the cycle, the first Louisville cycle since Chris Dickerson on July 26, 2007. For July, he led the International League with 37 hits, four triples, a .689 slugging percentage, 1.125 OPS, 18 extra-base hits and 71 total bases. He also ranked in the top five with a .359 average, .436 on-base percentage, 20 runs scored and six home runs. The 18 extra-base hits bested his June total of 15 and are the most since for a Bats' player Felix Perez had 21 in May 2014. Schebler is currently hitting .311, the fourth-best average in the circuit with 39 extra-base hits, the sixth-most in the league. In 27 games played in July, he had at least one extra-base hit in 10 of them and at least one RBI in 13. Schebler is the first Bats player since Brooks Kieschnick in 2000 to hit six plus homers in back-to-back months in the same season. Schebler is in his first season in the Reds organization after being traded to Cincinnati this offseason as part of a three-team trade for former Louisville Bat Todd Frazier. He is a resident of Solon, Iowa and was a 26th round selection by the Los Angeles Dodgers in 2010.